…has purchased a gift for all of its parishioners! 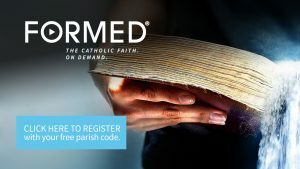 Please enjoy this FREE subscription to Formed.org, where you can stream hundreds of hours of inspiring movies and video series, read bestselling Catholic eBooks, and listen to audio presentations from the Church’s most compelling speakers! All available from virtually any device…anytime, anywhere. Go to Formed.org by CLICKING on the image to the RIGHT. FORMED is sponsored by: Our Lady of Guadalupe’s Knights of Columbus Council #8306 and A.C.T.S. Ministry. Questions? Call Kathy Tragos at (210) 695-8791, ext. 108.